This is just a discussion about what's theoretically possible. No, I don't actually have Morroblivion in Tamriel Worldspace, and I'm about the last person you should ask. But! I do believe it should be possible, using Onra's Tamriel Heightmaps, aka Tamriel World Map Project, or TWMP. 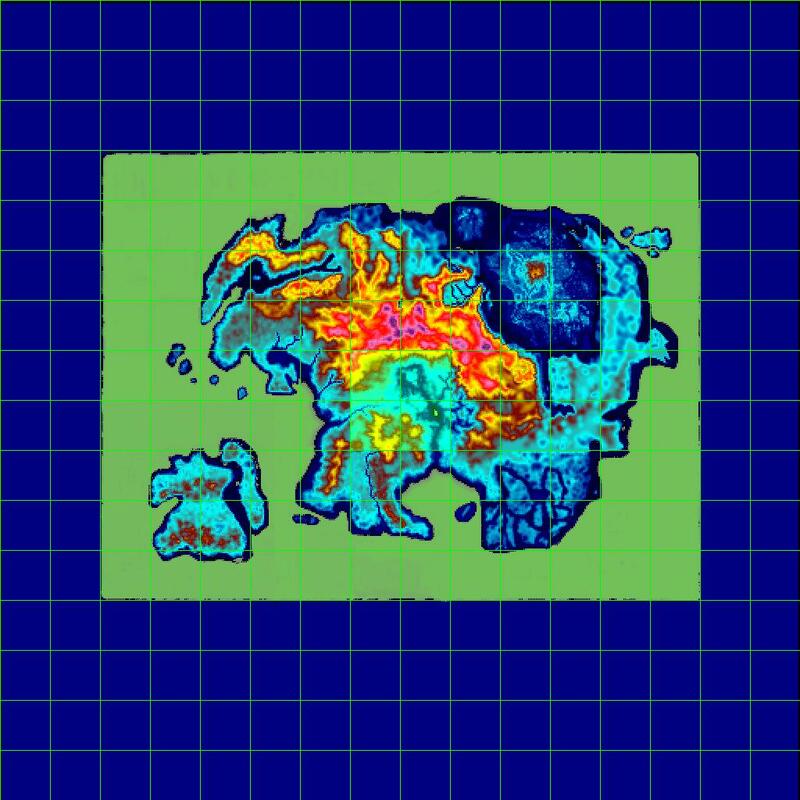 It seems Onra used actual heightmap data derived directly from TES III Morrowind by TESAnnwyn for the islands of Vvardenfell and Solstheim. I'm a latecomer to all this, but I imagine the Morroblivion heightmap was more or less also derived this way. The result for TWMP is something that's not "to scale" but is the same size as TES III's heightmap. This is not a guess. We can show this looking at Onra's actual heightmap and this helpful comparison between TES III and TES IV heightmaps, also derived from TESAnnwyn's heightmaps (Source. The "Vvardenfell 2x" stuff is irrelevant for our purposes). I took the Cyrodiil and Vvardenfell heightmap image, pasted it over the TWMP heightmap image, and scaled it so TESAnnwyn Cyrodiil was the same size as TWMP Cyrodiil. I then repositioned the proportionally scaled TESAnnwyn Vvardenfell over the TWMP Vvardenfell (I did NOT scale it again! ), and lo: I'm sure the technical challenges of moving a large province mod from one worldspace to another are not to be lightly dismissed. Again I'm the last person one should ask to actually undertake this. But if the TWMP heightmap for Vvardenfell is not only the same size as the Morroblivion heightmap, but like Morroblivion is also derived directly from TES III's heightmap, then that's at the very least good news for such an undertaking. TWMP and Morroblivion were developed at around the same time, so I'm prepared to be humbled and told that this idea was considered and dismissed for very good reasons. Otherwise, do with this info what you will. Huh...that's actually pretty interesting. I imagine it's possible to some extent, although it would take a tremendous -- perhaps unreasonable -- amount of work. It would definitely be awesome, if it could be done. I think TES4Edit could be used to "offset" the worldspace coordinates within the Morroblivionn worldspace to align roughly with the TWMP Morrowind, then transfer the contents over. You'd need to comb through every single cell to find floating objects/inaccessible points/stuff, though. Cool, glad you think so! As I say, I'm not the guy to try this, but if someone needs someone to tediously look for floating rocks in Tamriel, I'm the guy. It wouldn't be quite as nifty since the heightmaps wouldn't actually match as nicely, but imagine if ponyrider's efforts to convert Tamriel Rebuilt could then be overlaid onto TWMP Tamriel. That'd be pretty okay. Sorry for the late response. I've been spending most of my time in hospital dealing with family medical emergencies. What you describe is almost correct except that one map cell in Official Morrowind is equal to about four map cells in Official Oblivion. Hence the scaling issue that I've mentioned on multiple previous posts, unless you want to visit a miniature Vvardenfell that's like a putt-putt/mini-golf park on the TWMP Tamriel Heightmaps. Maybe I'll add an option to the modexporter to produce a "mini-golf" Morrowind world that fits directly on top of the TWMP Tamriel Heightmaps to prove it to you in-game so we can all put this issue to rest. No problem, and thanks for replying! I hope all is well with you and your family. I'm really uncomfortable with gainsaying you, since you've obviously looked closely at the two games. But here are some thoughts that remain sticking points for me. Maybe you can help me understand. -You've mentioned different cell sizes, but the comparisons I'm looking at are for heightmaps, not cellgrids. Now as I said, my analysis presumes that TESAnwynn's comparison between the heightmaps was a true comparison, meaning that he would have adjusted for things like different cell sizes. Maybe that assumption is incorrect, but then what would the point of the comparison be, unless he just didn't know what he was doing? -Also, if the cell dimensions in TESIII are already twice the size as TESIV, what's the point of doubling them again as TESAnwynn was doing for the Silgrad Tower project (in service of which was the whole point of making the heightmap comparison in the first place)? 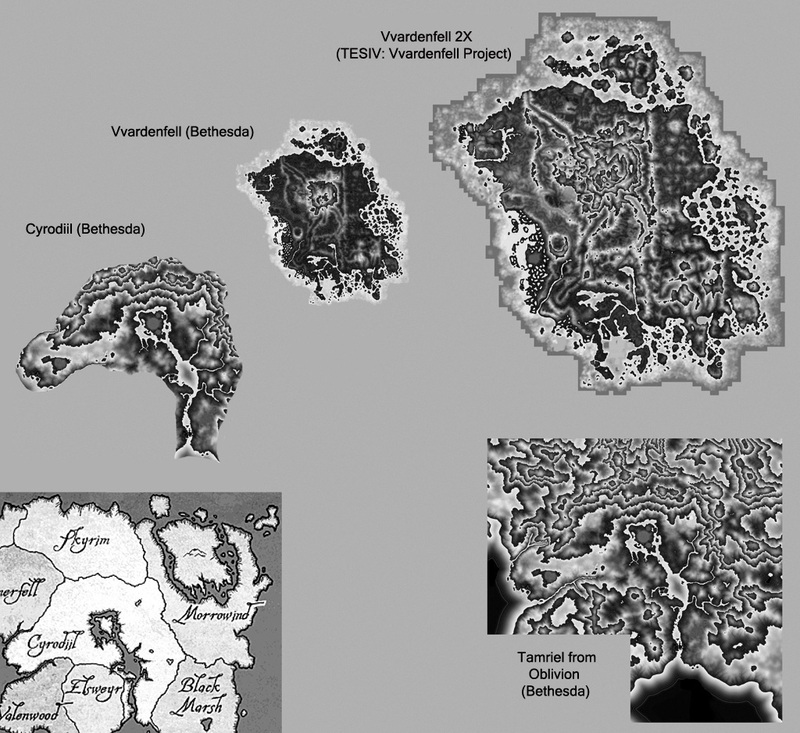 I also feel like we should be clear that TWMP Vvardenfell is larger than the official Bethesda maps of Tamriel suggest it should be. That to me would be consistent with TESIII Vvardenfell having larger cells than TESIV Cyrodiil. And if I'm right that all these heightmaps derive from TESIII in the same way, it's a good thing! because it would make moving Morroblivion Vvardenfell to Tamriel worldspace relatively straightforward. Maybe that's not even a point of contention, but I thought I'd try to make it clear. Edit: "TESAnnwyn" is the name of the the modding utility for exporting heightmaps, not the programmer who made it, who goes by Lightwave on his website. You are correct. I over-simplified my reasoning due to lack of time to go into all the scaling factors. The in-game map cells are indeed different from the Morrowind game engine to the Oblivion game engine: the Morrownd in-game cell grid address of (20,20) actually translates to the Morroblivion in-game cell address of (40,40) -- I'm specifically using Morroblivion instead of Oblivion because there is also a change in the (0,0) origin point as well. I've already written multiple versions of this explanation already and I know you and others have already written multiple versions of questions and counterpoints to my explanation. So instead of continuing this thread and restating what's already been said, give me some time to work on a literal translation of Morrowind gamespace (aka Vvardenfell terrain, buildings, trees, creatures, etc.) which puts them directly into the TWMP Tamriel Heigtmaps equivalent of Vvardenfell so you experience concretely what I am ineffective at explaining with just words. It will take a few months but I think it will be time well-spent so that we can all be on the same page. My goodness! Such an effort would certainly be appreciated but also sounds like a tremendous project, just to convince stubborn holdouts like myself. In any case, your patience is definitely appreciated. Also, if procedures like TESAnnwyn distort heightmaps such that statics don't look right on them, I wonder how the Morroblivion team created a heightmap that was actually useful. TESAnnwyn does not introduce distortions. There is only a necessary mathematical scaling factor which is intrinsic in taking any <X,Y,Z> data point from the Morrowind engine and then placing that point at an equivalent position in the Oblivion engine. This is due to the very nature of the difference in programmatic data structures used to store these data points in the Morrowind engine compared to the Oblivion engine. And that itself is an another over-simplification. Again, I urge you to put a pause on this thread until I can implement the "mini-golf Morrowind" mod so you can experience in-game what I am talking about. And regarding the effort and time commitment to implement this project: I'm confident that this idea of trying to merge the full Morrowind gameworld with the Oblivion gameworld is very high on most desired features, whether or not people actually express it or not. So making this mod will hopefully answer many current and future questions. Perhaps it will also inspire new projects or ideas to integrate Morrowind with Oblivion that can bypass the mathematical issues above. Okay, I'll refrain from asking any more questions about the technical issues involved until you get a chance to finish the project. I would like to make sure I understand what the project is, so please indulge me in one more general question. What I'm proposing does not involve moving the Morroblivion Vvardenfell/Solstheim landmasses into Tamriel Worldspace at all. TWMP already does this. What I suggest is moving statics, actors, and other assets from Morroblivion onto this TWMP landmass. Puddles suggests a way it could be done using TES4Edit above, though it would probably create a bunch of floating objects that need fixing. Is that what you're thinking, or would that be feasible?